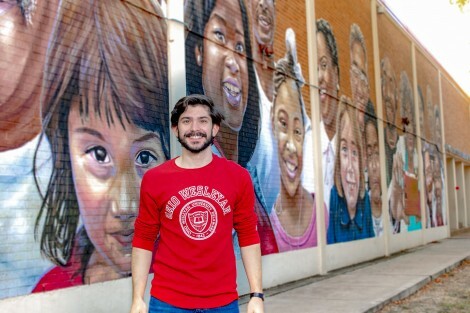 “Commonly referred to as Project Row Houses, this social mobilization of artists to enrich and preserve the culture and history of the Historic Third Ward in Houston, Texas, has as its defining feature the use of art. The implementation of which I was fascinated to study. “Their presence in one of the oldest African-American neighborhoods in Houston, with a cultural identity firmly established by the purchase of land by newly emancipated slaves in the 1860s and maintained by a thriving epicenter of black commerce and creativity in the 1900s, made me concerned to discover that the area, helped by the forming of Project Row Houses 25 years ago, is yet again facing the threat of gentrification. “Today, growing ever more rapid, the gentrification of the area is quickly displacing current residents and threatening the erasure of the 3rd Ward’s culture and history. The way Project Row Houses uses their model of intersecting art and community-level engagement is revolutionary and inspiring for Houston’s Third Ward neighborhoods and for the future of art and activism. “Through the successful funding of my small grant … I was able to experience good examples of arts impact on this ongoing community transformation and cultivate a deeper understanding of the project. I count this experience as an extremely meaningful one that has continued to stimulate further inquiry about the role of art in community discourse. “Visiting these meaningful artistic monuments and opening dialogue with current residents and current local artists about the revitalization effort and continuing pressures of gentrification in the area, was the goal of the experience. However, it left me with so much more.